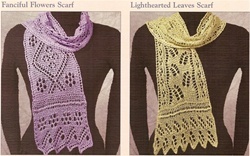 Lacy Botanical Scarves lace knitting pattern by Fiddlesticks knitting. The Lacy Botanical Scarves embrace a foliate theme, with lace images of flowers and leaves. "Fanciful Flowers" portrays a whimsical garden knot path dotted with daisies and flower buds. "Lighthearted Leaves" shows a cheerful scatter of leaves, perhaps blowing in the wind. Each scarf is about 7.5" wide by 55" long after blocking, and uses about 265 yards laceweight yarn. Recommended for Intermediate Lace knitters. 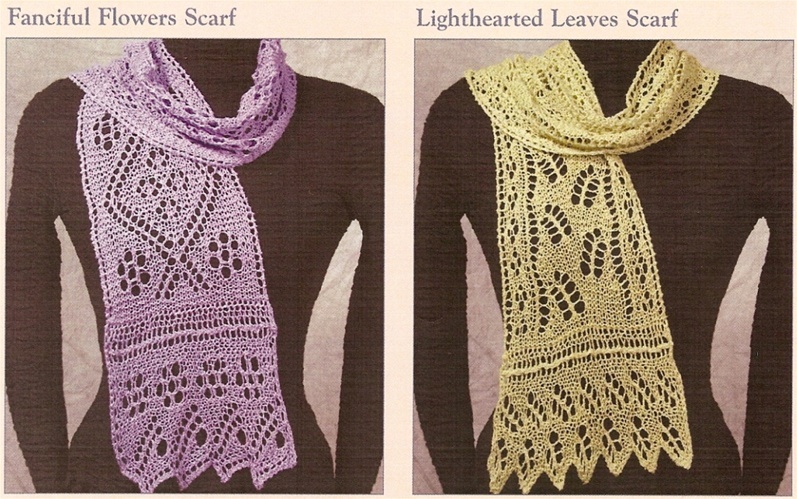 These are garter lace scarves.